Ryan Saunders turns 33 on April 28. By then he might have the interim tag removed from his title as the Minnesota Timberwolves head coach. Being named the NBA club’s bench boss might be the best present of his life, but will it happen? Owner Glen Taylor told Sports Headliners last month he hadn’t interviewed anyone else to be the head coach. Taylor was definitely pro-Saunders several weeks ago. “…I am hopeful that it all works out for Ryan because I like him as a person particularly, and I want all our people (in the organization) to be successful,” Taylor said in a March 10 Sports Headliners column. The Timberwolves announced the promotion of Saunders to interim head coach in early January, replacing the fired Tom Thibodeau. Saunders was on Thibodeau’s staff and had worked in the NBA since 2009 but no one had offered him an NBA head coaching position before. The opportunity to become Minnesota’s interim head coach happened quickly in January. Before accepting the promotion he sought input from the “most important people” in his life including family members. He also thought about Taylor who he had known for a long time and been comfortable with. “There’s nothing like breaking into your first coaching job in that situation,” Saunders said about Taylor. Since taking over the team Saunders has compiled a record of 17 wins and 25 losses while directing a Wolves team that ended its season last night with an overall record of 36-46. He acknowledged the team’s play has been one of “ups and downs.” Under his direction the Wolves never won more than three consecutive games and they had one five-game losing streak. Because of injuries the Wolves didn’t come close to their potential and that makes it more difficult to evaluate Saunders’ performance. Major contributors Robert Covington, Luol Deng, Taj Gibson, Derrick Rose and Jeff Teague missed over 100 combined games. Saunders found himself starting players (and adding others to the roster) that wasn’t part of the plan. 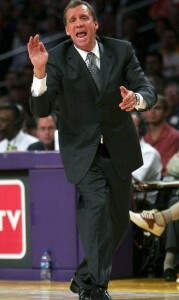 Saunders’ father, the late Flip Saunders, was the franchise’s president of basketball operations and head coach at the time of his death in 2015. If Flip could critique his son’s work this winter and spring, what might he say Ryan’s performance? Ryan became the NBA’s youngest head coach in 40 years when Taylor promoted him. Saunders has shown a willingness to listen, including to older voices. He communicates regularly with the Wolves owner, whom he refers to as “Mr. Taylor.” He added Jerry Sichting, 62, as an assistant coach after he became interim head coach. “He’s just been a great help to me,” Saunders said about the 59-year old Wittman, who was head coach of the Timberwolves for all or parts of three seasons starting in January of 2007. A coach can fairly be evaluated over a duration of 12 months, a period that includes offseason work with players, teaching during training camp and coaching a full season of games. Saunders has a reputation for player development and that skill will be needed in working with a roster that might not be talented enough to make the playoffs next year. The team’s major asset, of course, is Karl-Anthony Towns, the 23-year-old NBA All-Star center. When Saunders thinks about his offense, he wants a balanced approach that includes pushing tempo but not ignoring a “dynamic post player like Karl” who needs to regularly be given the basketball near the basket. “We have a special talent in Karl that we play through,” Saunders said. At times the Wolves have been among the worst NBA teams defensively. During a six-game stretch this winter the club gave up 120 points or more each time out, with opponents four times scoring 130 or more. As of yesterday, only five of the NBA’s 30 teams were giving up more points per game than Minnesota at 114.2, per Foxsports.com. Saunders said establishing a “defensive identity” will be priority no. 1 in training camp. Saunders is a communicator who is enthusiastic and positive. He’s already a basketball lifer who relates well to people and is a product of “Minnesota nice,” having been born and raised in suburban Minneapolis. He seems like a coach players want to play for. But is he demanding enough to get the most out of the players? Saunders could answer that question somewhat this offseason and for sure next season during a full schedule of 82 games, but one thing that could derail his promotion to permanent head coach is the front office situation. Scott Layden is the general manager now, but he is a carryover from the Thibodeau era when Thibs was not only the coach but president of basketball operations. Taylor announced yesterday he will hire a new president, and that could certainly impact the security of both Layden and Saunders. With new leadership in the front office, Taylor will have to decide whether to allow the president to choose the coach, or strongly suggest Saunders should be the choice. Even if Saunders isn’t made the permanent head coach, it seems likely given his relationship with the owner and his popularity in the organization, he would be offered a position to continue on with the Timberwolves. However, that’s not the best news he could have around his birthday.